Brooklyn, NY - The Lamplighters Yeshiva, a Jewish Montessori school based in Crown Heights, was featured today as part of a continuing series by DNAinfo.com (http://bit.ly/14dmpLn) on Jewish parochial education in Brooklyn. The school is being praised by many for its emphasis on both secular and religious studies. Sidof’s efforts have started paying off, as the Crown Heights community has begun warming to the unconventional yeshiva. “We’re starting to be recognized by the community – they’re coming here to visit,” said Rivkah Schack, co-director of Lamplighters. The yeshiva currently has an intensive teacher training program and hopes to add a first and second-grade class for girls next year. There are actually some yeshivas out there, that will not take your boy into first grade if he attended a co-ed preschool class. I kid you not! The school was not founded by Yocheved Sidoff. It was founded by Matisyahu. After he left the neighborhood, Yocheved became the self appointed director. What makes this a Chabad yeshiva? Chabad means according to the will of the Rebbe. The lubavitcher Rebbe was ready to fight till the end for chinuch 100% Al taharas hakodesh. Three one who stood behind the only (?) Elementary school in America with zero secular studies to this day. Woe to those who try to paint Chabad as modernish - far from the truth. 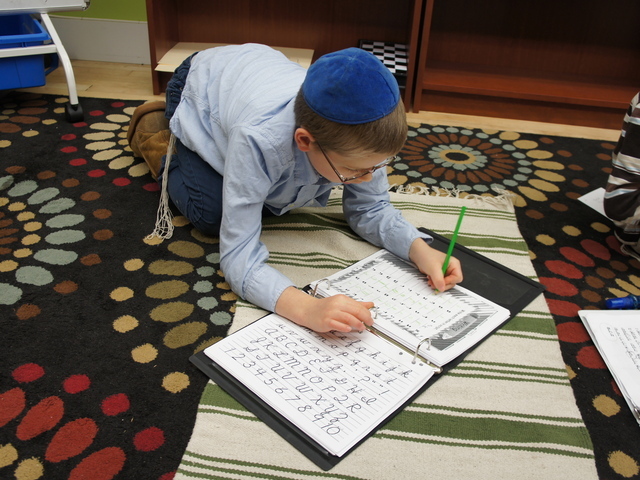 The picture shows a boy on the floor writing. This is not acceptable in any secular preschool. At this age, the students need to sit on a chair and have a flat surface. Their method goes against all educational precedures. Thank you for the clarification. NOW, this story makes sense! "Chabad means according to the will of the Rebbe." In what language does chabad mean that? I dont deny what you are saying however, why then are the Chabad lubavitch schools who cater to frum and baalei teshuvois all over the US, Blue Ribbon Yellow Ribbon green ribbon schools who thrive and strive for secular excellence and offered all the honor and kovod by the Merkos le'inyonei Chinuch when it should be the other way round??? I think this is a very big problem that while everyone quotes when it suits them in action its ipcho mistavra. Was that a joke, or are you just nuts? So this is not any kind of yeshiva, this is a Montessori school, which is basically a secular school with some kind of "Judaic curriculum" mixed in in the smallest measure. I live in Crown H and I am very familiar with the Montessori method. Here's my insight: the way the child is working (on a rug) is in typical Montessori style. Montessori is a *method* of learning, not a specific subject (so comment 13, no, it's not secular by default). Check it out on Wiki if you are curious... Montessori has its die-hard fans and its critics. (Comment 6, my guess is you have never been in a "secular preschool" if you think children age 4 and 5 belong in chairs. Comment 8, yes, calling a school Chabad means it is run according to the Rebbe's teachings.) There are many Chabad House preschools that use the Montessori method and teach Jewish and secular subjects to nonfrum and frum children. I know for a fact that the Lubavitcher Rebbe did support boys studying English... starting from age 9 when they already have a solid foundation in Yiddish subjects and Hashkafa. The biggest boys' school in Crown Heights teaches no English (many parents supplement with English/math/science at home or with tutors) and the second biggest boys' school has optional English after school starting from (I think) 4th grade, and the kids whose parents want them to take Regents go there. As for the comment about Matisyahu's involvement- it is true to a degree! His wife is still Chabad and has been since they got married at least 8 years ago. They have a few boys and a few years ago they were looking for a school that they both liked... couldn't find one, so they made one (ain't it great to have lots of $$!!). Yocheved was involved from day one. Matisyahu and family live in California now and don't have anything to do with it anymore as far as I know. Read the article again, then you will see that your comment makes no sense. keep reading over and over until you see the part about full yeshiva curriculum. montisorri is an approach to teaching, not a topic. “ I live in Crown H and I am very familiar with the Montessori method. The DNA article does not designate Sidof as the "sole" founder. The original founding families were the Sidofs, Shapiros, Seligers and Millers (Matisyahu and his wife), together with a local educator, Devorah Kessler. The Miller's moved to California before the second year started, and have not been involved in its leadership since. As far as the "Chabad" direction of the school, the founders and new ed directors, M and R Schack, are in close contact with some of the most respected educators and mashpiyim in Crown Heights, who are all very supportive of what Lamplighters brings to the table. Finally, the DNA article chose to focus on the secular studies aspect of the school, as if it were the reason the school was founded. This is untrue. The school was founded to offer the charedi community a solution for its desperate need for an individualized approach to education -- to address the WHOLE child and turn "Chanoch Lenaar Al Pi Darko" from a slogan into a reality. As part of this mission, it offers a holistic approach to the secular and the holy, teaching all through the lens of chassidus.